I was recently at a friend’s house for dinner and he asked me at one point whether I’d heard about the new Robert Zemeckis movie. He said it was apparently based on the true story of a man who had been so severely beaten that he lost all his memory and, as a result, had embarked on a strange project which involved building a town and populating it with dolls through which he constructed elaborate narratives which he then photographed. The man’s name is Mark Hogancamp and in Zemeckis’ movie he’s played by Steve Carrell. I hadn’t heard anything about the movie, or about Mark Hogancamp’s story. But by one very strange coincidence, a week later I took a stack of DVDs into one of the few remaining used disk stores in Winnipeg (you don’t get much money for them, but the owner of this particular store gives me a more generous price than most … I’ve been going there for years and he knows that I’m likely to be selling things which are a bit more obscure and out of the mainstream) and while he was figuring out what they were worth I browsed. What my friend had told me was nowhere in mind after seven days, but my eye was caught for some reason by the cover of a Blu-ray and I took it down off the shelf. 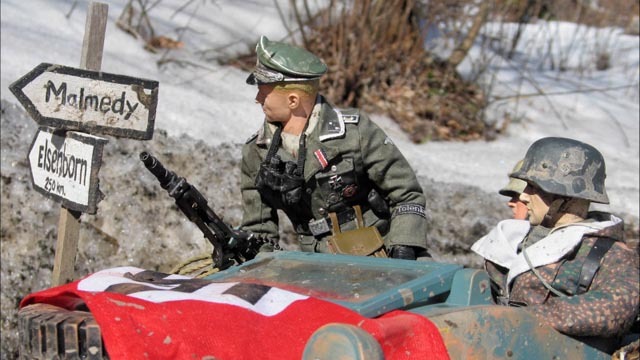 It was called Marwencol and when I read the back, I discovered that it was a documentary (made in 2010) about that very story. Totally bizarre that I should find it immediately after hearing about Mark Hogancamp for the first time … so naturally I had to buy it, and when I got home I watched it immediately. 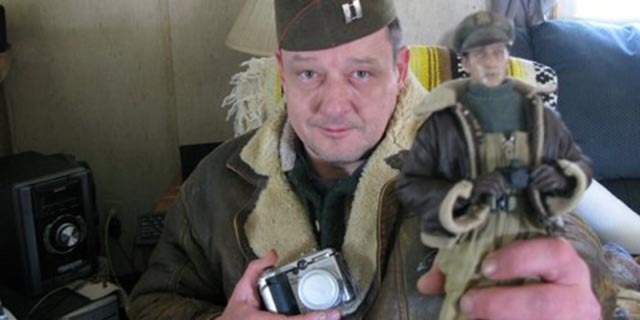 Marwencol is a fascinating film in a number of ways, not least in that it was the first directorial effort of Jeff Malmberg, an editor and producer mostly of documentaries (he’s an executive producer on Zemeckis’ feature). As a character study, it’s complex and thoughtful, made with subtlety and an eye for unforced dramatic structure. Relying mostly on Mark Hogancamp’s voice, supported by interviews with the people around him, it focuses on his massive creative project, while gradually revealing details of his background and the traumatic event which changed his life irrevocably, details which inform and illuminate the meaning of that creative project. In 2000, Hogancamp, an alcoholic in his late thirties, left a small bar in Kingston, New York. Five young men followed him out and beat him so severely that he was in a coma for nine days. His face had to be reconstructed (the bones of his right cheek and eye socket were shattered and had to be replaced with plastic) and he was left with brain damage which all-but erased his memory. He essentially had to relearn everything from scratch – how to walk, how to talk, how to feed himself. After forty days in hospital, money ran out and he was discharged with no options for further therapy. And so … he began to devise a therapy for himself. The documentary doesn’t actually get into the original roots of what shaped his process, but it depicts that process in detail. Hogancamp began to put himself together by telling stories. Or rather, by physically creating stories, with himself as the central character. In the yard of his home, he built a small town out of scraps of plywood and gradually populated it with articulated dolls. 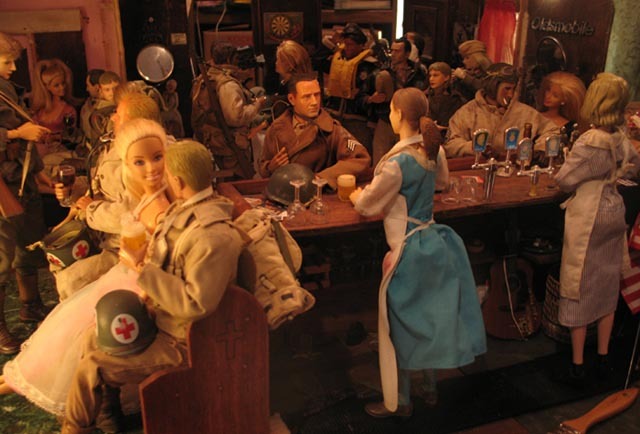 The setting was Belgium during World War Two, and he eventually named the town Marwencol, a combination of his own name and those of two of the key female characters – Mark, Wendy and Colleen. He incorporated the people around him into the stories, individualizing the dolls to look like his neighbours, his friends, his co-workers. And always he was at the centre of the story. He built a bar which his character ran, although he himself had lost all taste for alcohol – even in his own bar his character drank only coffee. Although there are tensions among the characters, and some elements of the narrative victimize women, as the stories progress the women (some female Russian soldiers, a fiancee, and also a figure named Deja Thoris who has magical powers) gain in strength and take on an important role in saving Mark from sadistic members of the SS. It becomes clear that the victimization of the Mark character is not so much a masochistic fantasy as a displaced working out of post-traumatic stress. 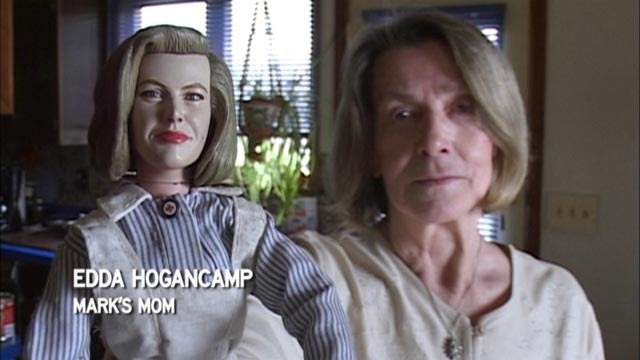 Through the doll, Hogancamp repeatedly relives his own victimization and finds ways to get through the brutal trauma and survive. As for why it is women who save him, we learn late in the film that Mark’s life was really saved by a woman who discovered him lying unconscious in the middle of the street and called for help. In that late scene, Hogancamp meets her for the first time and she shows him where she found him. The complex, on-going narrative of war in the constructed town provides the therapy Mark Hogancamp could not afford to pay for. (This financial aspect is not really remarked on in the film, but seems inexplicable to someone who lives in a country with a rational healthcare system – but then, if he had received formal therapy, would he ever have developed what became his art?) He has created a world fraught with the threat of violence, violence which his projected character suffers over and over again, but which also contains some hope for relief and recovery. The graphic depiction of the deaths of Mark’s SS tormentors expresses the real Mark’s anger towards the five men who almost killed him. All of this would have remained a strange, hidden personal story except for the fact that Hogancamp photographed all the scenarios he was inventing for the inhabitants of his imagined town. Although he did this just for himself (we learn that once he got the pictures back from the lab, he would throw out the negatives and just keep the printed images in boxes), a local photographer named David Naugle, who would occasionally see Mark walking alongside the road pulling a toy jeep, finally stopped to talk to him. 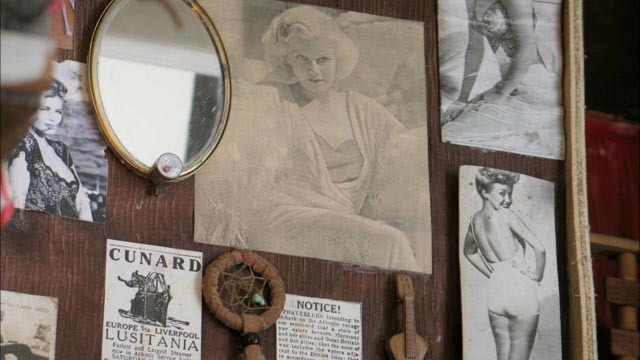 Hogancamp showed Naugle his pictures and their remarkable dramatic power eventually set things in motion which led to a gallery show in Greenwich Village. Mark Hogancamp’s self-therapy project, embarked on purely for his own emotional recovery, by becoming public, was transformed into art. 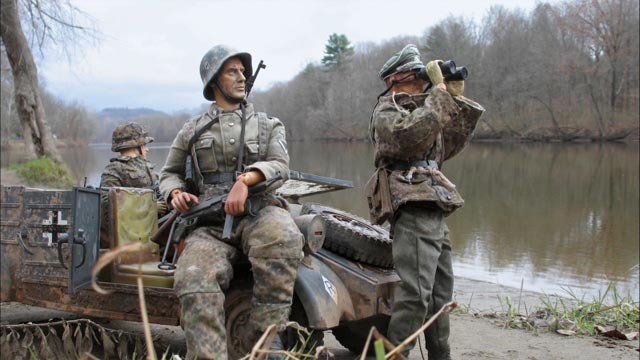 The final stretch of the documentary deals with Hogancamp’s conflicted feelings about making his private world public; he didn’t conceive of Marwencol and its inhabitants as an art project, but as a way to give shape to the confusion he felt after the loss of memory and a sense of self rooted in a past which was no longer accessible to him. It is only towards the end that we learn at last what triggered the attack back in 2000, a detail which adds a new layer to this multi-layered film. The preparation and opening of the show become for Hogancamp a challenge to his ability to reveal in public a crucial aspect of his identity – the same aspect which caused those five men to beat him almost to death. It becomes clear in the documentary’s final moments just how far his therapeutic efforts have taken him. 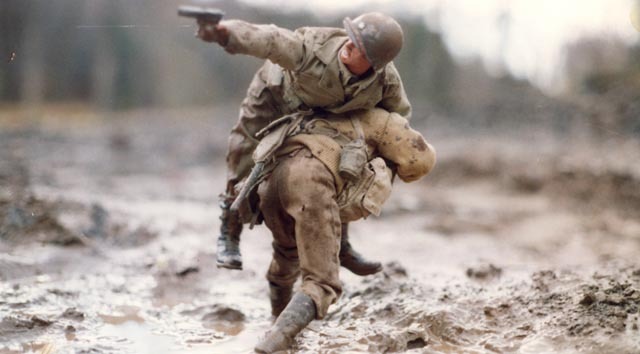 Shot on digital video and super-8, Marwencol gives powerful life to Hogancamp’s miniature town and its inhabitants; visually, Malmberg models many of his shots on Hogancamp’s photographs, creating a surprising sense of realism and scale in the vivid scenes out of which the town’s stories are constructed. I have no idea why I had never heard of this film, and this story, before – or why it suddenly turned up like this – but I’m grateful for my friend’s passing comment that evening because this is one of the best films I’ve seen in the past year. 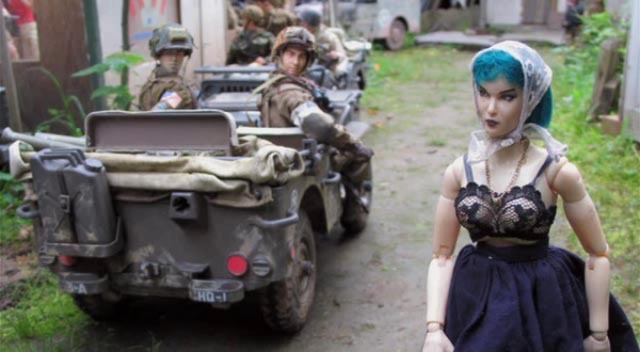 The Cinema Guild Blu-ray is excellent, doing the best it can with the DVCam footage (interlaced, so not as sharp as a progressive HD image); that grainy imagery makes Mark Hogancamp’s still photographs pop with a distinctive feeling of hyperreality, somehow making the constructed scenes of war in the town of Marwencol seem more real than Hogancamp’s fragile real life. There are quite a few extras: almost twelve minutes of narrative sequences from the town; nineteen minutes of deleted scenes – which for once don’t seem extraneous as they reveal important details which illuminate aspects of the story not always apparent in the finished film; a brief clip in which Hogancamp watches the film for the first time and reacts to seeing his story as told by Malmberg (he really likes it); another brief clip in which Hogancamp constructs a miniature red carpet diorama in front of the theatre where the documentary premiered; a stills gallery with 31 of Hogancamp’s photographs; and a trailer. Elvis Mitchell provides a brief text introduction and there’s a card reproducing one of Hogancamp’s photos. This entry was posted in Review and tagged Blu-Ray, Directors, Documentary. Bookmark the permalink.